Hippie Chick Design: Choosy Chicks Choose Chicklets...REVEAL TIME! Here it is fresh out of the envelope...colors selected at random but how perfect is it that I got a lilac, purplish one? If you don't know me, I'll just say it's PERFECT! Now in the meantime I had managed to snag a couple of Shine On Collaboration Kits from Staci Louise Originals and Genea Beads. These two lovely ladies have created some awesome collaborations and the Shine On kits were no exception. I rarely make jewelry for myself but I specifically purchased the kit to design something for me...but rebel that I am...I wasn't going to just follow the kit design/instructions. Anyway, I tell you all this because the kit was on my table when the chicklet arrived and as they say...the rest is history! Aren't Genea's beads delicious? Deep, gorgeous colors! and a close up of the charms which include a sterling silver pentacle, a goddess offering, blackened brass wing...yes from Fallen Angel Brass...and a lampwork headpin from the kit. The small dangles on the pentacle are faceted moonstone and crystals. Also, a peek of the beautiful coloring in polymer clay star focal made by Staci. Here is the entire necklace. I've worn it several times...both my daughter and mother have tried to steal it right off my neck! But this beauty is all MINE! THANK YOU again to Rita for her generosity! 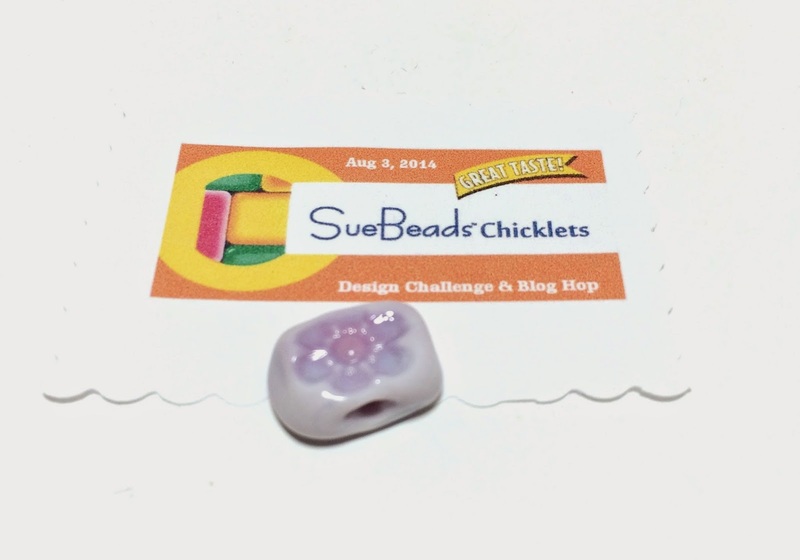 Thank you Sue, your beautiful beads have brought me much joy and inspiration! Don't you love serendipity? Beautiful piece, and definitely one to keep! the colors match perfectly, and such an unusual collection of beads. I'd say serendipity too, but someone else already had. Great work - love that you combined the beads for the charm effect. Your colors are great and a lovely piece. Lovely lovely design. You pulled together a wonderful eclectic mix of beads and charms with metals and fibers and it all came together perfectly. Amazing wonderful piece. I love how all the colors and textures go together. Thanks Lori! I'm not sure where they might be available...I happened to find mine at a local magick/herb shop. It was sitting on the counter in a small bowl of goodies by the register and I just couldn't pass it up. It is called a goddess offering ...so you might try google. I love it! Very talismanic and amazing. This is really beautiful! I have admired Genea/Staci's kits and really enjoy seeing one used here along with the lovely chicklet. Great job and really fun to see. What an incredible necklace with such empowering charms. Just love it! I love the different colors of purple that you used. It flows nicely! How neat, I would never have thought of charms. An absolute gorgeous work of art, great colors, great components, great design! Ok, that's just a stunner from the word go! It's like a celebrity piece, with all those gorgeous artisan beads! I just adore that color palette too! What a striking necklace Kari. No wonder your daughter and mom want to steal it off your neck. Hang on tight, 'cuz its a winner! How SPLENDID! I LOVE LOVE LOVE LOVE that purple silk *drool* Such a beautiful piece and I love the black wire with it.... brilliant! Great design - love the colours! Oh how nice. These are such great beads. Wow! I love how you put all of those great art beads together. This is a really stunning piece. I love your necklace, you better hide it!! Gorgeous necklace! I can appreciate why your daughter and mother both want it. Eclectic and full of great components. Lovely asymmetrical design. Aren't you lucky to have snagged one of Stacy and Genea's kits. I was drooling over them. Love what you did with all of your goodies , especially the chicklet! How beautiful! I love the colors and how your chicklet really shines. Excellent Job! Oh my goodness. This amazingly stunning. I love that star bead so much! What a stunning used of mixed media.